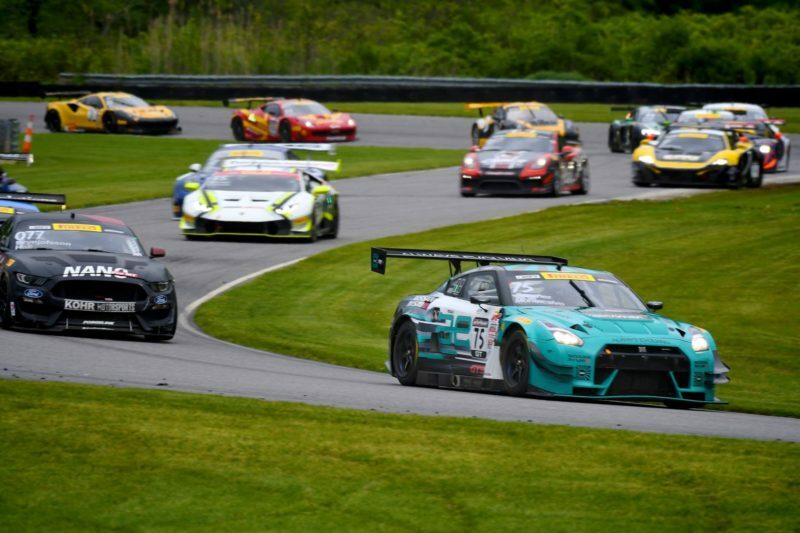 Tuesday, May 30, 2017 – Highlands, NJ – Always Evolving/AIM Autosport driver Frankie Montecalvo, along with teammate Ricardo Sanchez, scored not one, but two podium finishes at Rounds 5 and 6 of the SprintX Series at Lime Rock Park over the weekend. The race weekend featured a very condensed schedule that only saw one practice before qualifying on Friday. Montecalvo was actually not able to participate in that practice because of a red flag that came out cutting the one and only practice short. However, that did not stop Montecalvo from turning several fast laps in qualifying and ultimately putting the No. 75 Nissan GT-R NISMO GT3 on pole in the GTA class for Race 1 of the weekend later that afternoon. “I’m really happy to come away from the weekend with two podium finishes. Friday morning didn’t go as scheduled, because I wasn’t able to turn any laps before qualifying,” explained Montecalvo. Race 2 on Saturday afternoon started out with a big crash in turn one which Sanchez was able to avoid. However, debris from the other cars produced issues for the No. 75 machine forcing Sanchez to make an unscheduled pit stop early in the race. In case you missed either of the SprintX races, you can catch the broadcast on Sunday June 4 at 5:30 PM EST on CBS Sports Network. Also, don’t forget to follow Frankie on Facebook, Twitter and Instagram to stay up to date with all of his racing news!